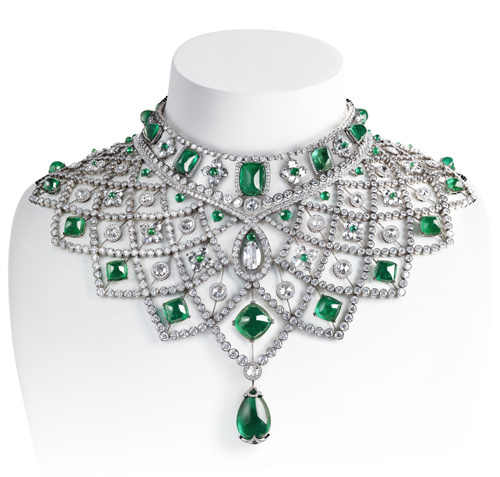 Fabergé, the legendary master jeweller creating High Jewellery, Fine Jewellery and precious Objects honouring the genius of Peter Carl Fabergé, presents the Romanov Necklace, a magnificent contemporary emerald and diamond collar, inspired by an historic design from the House of Fabergé. This spectacular creation, a modern masterpiece, is a regal reworking of an early Fabergé jewel, recreated and contemporised from an archival gouache design dated 1885. The necklace, striking in its timeless elegance, was conceived by Fabergé’s in-house design team in collaboration with a leading Parisian high-jewellery workshop. The complex and challenging design process took two months, followed by 14 months of intense and meticulous hand workmanship by some of the world’s finest artisans, goldsmiths and gem-setters. The breath-taking composition was conjured from a dramatic collection of 79 emeralds of exceptional quality, totalling 186.85 carats, featuring specially-cut sugar-loaf cabochons and a single pear-shaped drop of 30.65 carats. The emeralds, ethical and ecologically sound, were sourced directly from Gemfields’ Zambian mines and hand selected one by one, in the rough, at auctions over a period of a year, by Fabergé’s Creative Director, Katharina Flohr, who ensured that the emeralds were perfectly matched in colour and character. Each rough emerald was then cut to the very particular specifications of the design. Superbly crafted in white gold, the Romanov necklace is ingeniously articulated to spread over the shoulder and neckline in a silky openwork trellis of sumptuous emeralds and white round diamonds and rose diamonds, shimmering with a soft, vintage lustre. In all, the necklace is set with 2225 gemstones, totalling 363.48 carats, including 1991 round white diamonds, totalling 98.15 carats, 151 rose cut diamonds, totalling 43.29 carats, with one rose diamond of 0.67 carats and a pear-shaped rose cut of 3.48 carats.